Full Description: Ref: ID4155 NEW BUILD limited availability KEY READY - Our apartments and Penthouses have lounge dining room, two bedrooms and a bathroom with a large terrace, 18m2, with magnificent views of golf. The kitchen of these apartments is furnished and equipped with oven, hob, extractor, refrigerator and dishwasher. It also includes ducted air conditioning, LEDs and bathroom equipped with a vanity unit, a mirror and a shower screen. Prices from 82,900 EUR 1 x PENTHOUSE Key ready 89,900 EUR Terrazas de la Torre Golf Resort is located a few kilometres from the two main cities of Murcia, its capital and Cartagena. It is 15 km from the beaches of Mar Menor and only 15 minutes away from the airports of San Javier and the International Airport of the Region of Murcia. Alicante Airport is almost 1 hour away. The Murcian coastline is characterized by its magnificent beaches of calm waters which make it a unique environment in which to enjoy the beach, sailing or any water sports throughout the year. 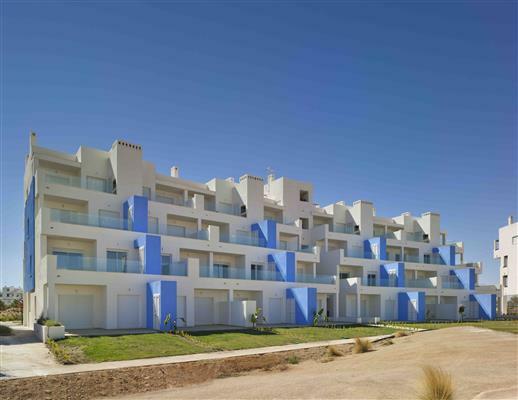 All the apartments are distributed around a Jack Nicklaus´ golf course. Desert-style, it is an 18-hole course, par 72, with a few bunkers, wavy streets and large greens. The residential has a Town Center that offers several services. You can also find a few playgrounds, large garden areas, several communal swimming pools and 24 hrs security. Our apartments, Penthouses, have two bedrooms and a bathroom with a large terrace, 18m2, with magnificent views of golf. The kitchen of these apartments is furnished and equipped with oven, hob, extractor, refrigerator and dishwasher. It also includes ducted air conditioning, LEDs and bathroom equipped with a vanity unit, a mirror and a shower screen.